Jordan Spieth's new Under Armour Spieth 3 golf shoes were designed to feel like Spieth's favorite training shoes. 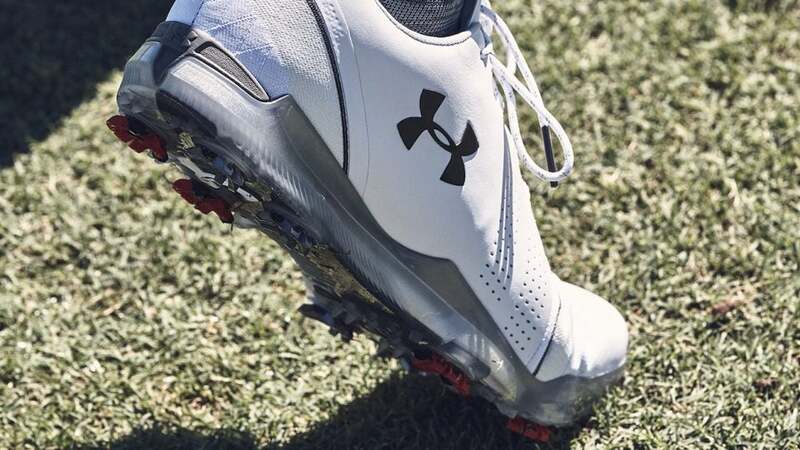 Jordan Spieth's new Under Armour Spieth 3 golf shoes were unveiled on Tuesday, and the goal of the new shoe was to create one that was designed to feel like Spieth's favorite training shoes that are worn in just the right spots with laces that have seen better days. Considering that Spieth is sponsored by Under Armour, you'd think he'd be ready for a fresh pair. But there's something about the way the shoes fit and continue to stay intact while taking a continual beating that makes him keep them around. In fact, Spieth has been wearing the same trainers to the gym for years. "I wear them every day, a couple of them are like two or three years old, the laces are all messed up, but they're my favorite Under Armour shoes that I use in the gym doing the moves that I train for my golf swing," Spieth told GOLF.com. So for Spieth, it was all about trying to find a way to take the fit, feel and lightweight materials from his trainers and turn them into something for the course. Working with a member of the European Tour Performance Institute who specializes in biomechanics, Spieth and the Under Armour's design team undertook the task of creating a shoe that was not only lighter than the previous version but offered even more traction and stability. "My one concern when we went lighter was that there was no way it was going to be as stable because you're not weighed into the ground as much," Spieth said. "I just wanted to make sure we did everything possible to make them as stable, if not more stable than the previous version." The traction system in the sole was paired with a Clarino microfiber upper and "Smart Woven" jacquard forefoot and heel counter that supports the foot during the swing. A strategically placed carbon fiber insert and EVA midsole were also added to provide comfort and support on the course. The UA Rotational Resistance Spike (RST 2.0) and Softspike Silver Tornado found on the sole not only improve traction but lower the overall profile without impacting the putting green. "I can tell they're closer to the ground," Spieth said. "So when I'm walking on the green, I can feel it better. And through the golf swing, it feels like my feet are gripping the ground, which is a difference maker you'll feel from the Spieth 2 to the Spieth 3." The overall weight of the shoe (13 ounces) was decreased with the help of a microfiber upper in the heel and woven jacquard in the forefoot. A waterproof membrane can be found just under the surface that breathes to release perspiration while keeping out additional moisture at the same time. According to Spieth, the entire design process typically takes two years, and during that time, he'll see anywhere from two to three versions of the shoe. While the final version was designed for public consumption, Spieth freely admits the shoe is created with his wants and needs in mind. But he believes a lot of those same requests he makes are things the recreational golfer could benefit from as well. "My input was selfish," he said. "This is what I think will help me. If it happens to help a consumer, fantastic. If it doesn't, it doesn't. But to me, if it helps me out, that's the number one priority. But I like to think if it helps me, it'll certainly help someone else as well." Under Armour's Spieth 3 retails for $200 and will be available Feb. 1. A look at Under Armour's Spieth 3 golf shoe from all angles.